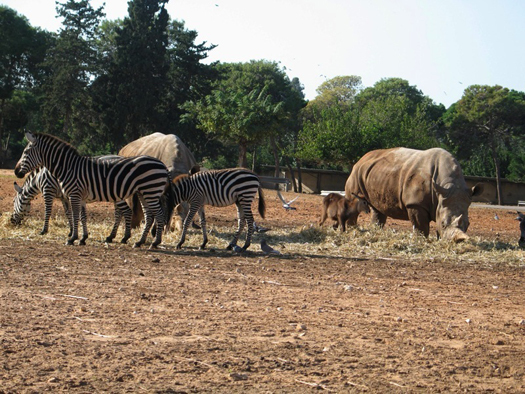 The Safari Park, which is part of the Zoological Center of Tel-Aviv Ramat Gan, is a unique African safari adventure in an open plains setting in which a variety of animals can roam freely. Travel in Israel is relatively easy, so from Tel-Aviv follow Yitzhak Sadeh Rd. until it merges with Hashalom, which soon thereafter changes it’s name to Aluf Sadeh. Turn right into Raziel, and after the second circle look for the sign for Safari Park ahead. From Jerusalem, take Route 1 and then Route 4, toward Haifa, exiting at Aluf Sade and follow the sign to National Park and then to Safari Park. Though the trip may take 45 minutes from Jerusalem, the Safari Park is a mere 15 minutes from Tel-Aviv. For children and adults alike, it is one of the most enjoyable attractions in Israel. As you and your family remain safely inside the vehicle, take a leisurely meandering drive to view roaming lions, hippopotamus submerged in the lake during the hot hours of the day, herds of zebras and gnus. Flocks of pelicans and flamingos can be easily viewed at the lake’s edge, impalas can be observed jumping to and fro while gazelles lounge in the shade. Also, the ostrich, which is the world’s largest living flightless bird, can be spotted throughout the Safari Park. And even on a rainy day you can easily admire the animals as they huddle under their rain shelter. The lions roam in a specially enclosed area protected by a series of gates through which you’ll drive by following the signs in the main parking lot. It’s easy to spot them; just follow the sound of their roar! In the middle of the park, a zoo has been established, which is easily accessed by foot. Alternatively, renting a golf cart and driver for a 30-minute drive to view some of the 1600 animals in the park is a fun way to see the zoo. During the hot summer months, the zoo provides a cool shaded area to view elephants, chimpanzees, giraffes and other animals unique to Africa. An interesting animal found at the zoo, which roams openly in parts of Israel today is the hyena, a scavenger whose strong neck muscles and high shoulders enable it to drag large carcasses to a safe hiding place. Some researchers theorize that the symbolic placement of stones on a grave in the Jewish tradition may have evolved from the need to prevent the hyena from uncovering bodies buried in the dessert. Also, the Israeli wolf, which can be often found in parts of Israel today, is safely presented for viewing. Large groups of baboons can be seen playing and grooming each other at the zoo. The ancient Egyptians respected baboons as holy animals and raised them in temples. As with humans and some other animals, the Egyptians also mummified their baboons. The zoo and Safari Park are a unique educational experience permitting the visitor to explore the behavior of animals in their natural environment, while the human species spends a few hours away from the hustle and bustle of the big city. The park provides guided tours for school age children, after school programs as well as summer camp activities. For groups of all ages the park offers early morning tours permitting you to watch the animals eat their breakfast, as well as guided twilight and night tours by tram to observe their nocturnal activity. For current hours and information call 03-6305305. As unique as the Safari Park is to the presentation of animals in their natural habitat, so too the Neot Kedumim Biblical Nature Reserve presents the plants of the bible in their natural setting. 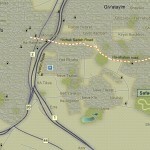 To reach the reserve from Tel-Aviv, exit Route 1 at Route 443 in the direction of Modi’in. Follow the yellow signs on Route 443 until the entrance to the Maccabee caves, and then backtrack to the entrance. 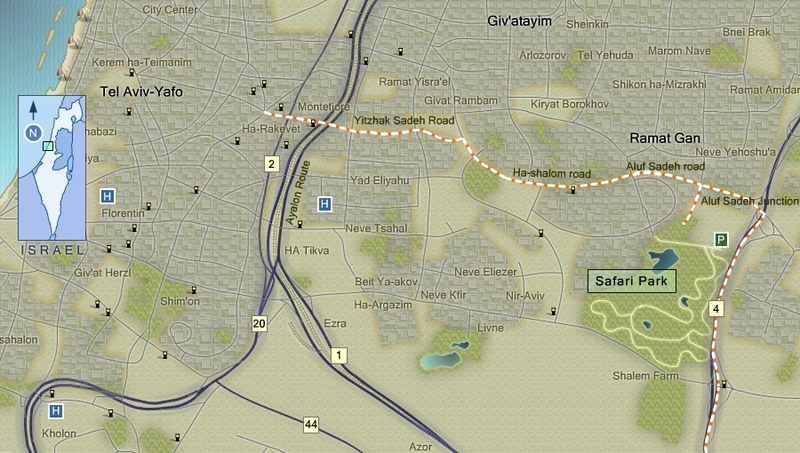 From Jerusalem follow Route 443 directly to the entrance of the landscape reserve. Neot Kedumim is a private reserve located on the Judean foothills leading to Jerusalem and a visit there can be a highlight of your Israel trip. The reserve is artificially landscaped to resemble the “Land of the Bible” before deforestation. Only by standing among the trees and bushes of the reserve, viewing the barren hills in the distance, can the visitor truly comprehend the effects that countless battles and removal of timber have had on the countryside. Today, the reserve is dotted with plaques citing biblical verses and their relationship to the trees, plants, bushes and flowers of the bible that have been planted. A number of different trails can be followed, but I have found trail number 1 to be most interesting as it provides the visitor with a truly biblical setting, which includes archaeological excavations of early villages, ancient water cisterns, winepresses, and animal pens. As you start your walk down the trail, one of the first stops will be a cistern whose 17 steps you can descend to its dark bottom. Perhaps while below ground it’s an appropriate time to think about Joseph who had been placed in a similar well by his brothers. Researchers have discovered 45 such cisterns in Neot Kedumim, leading them to extrapolate that in antiquity the area had supported approximately 500 individuals. From there it’s a short walk to the archaeological excavations which exposed a 5th century CE olive press and a village whose streets and foundations of homes and shops permit one to imagine Jewish life during the late Second Temple period. Nearby, several large winepresses from the 1st century and 4-5th centuries CE had been found hewn out of bedrock, which when taken together with the numerous olive presses discovered in the region, attest to the fertility of Modi’in in antiquity. The landscape architects of Neot Kedumim have made an extra effort to link the importance of King Solomon to the history of the Jewish people. For example, the planting of a grove of cedar trees is reminiscent of those brought by Solomon from Lebanon to construct the interior of the First Temple. The plaques at the nearby Pool of Solomon with its date palms, myrtle bushes, reeds and willow poplars, associates each of these to scripture. Indeed, the pool itself has it’s own connection to Solomon to whom is attributed the passage in Ecclesiastics which tells of constructing pools to irrigate a forest of growing trees. As you conclude your walk down trail number 1 you will find yourself in a forest of Tabor oak trees representing the oaks that once populated much of the Sharon plain. Also, several varieties of wildflowers, with their biblical connection, have been planted to represent the varieties that were indigenous to the coastal area. If time permits, you can continue on one of the other trails or just relax under a palm tree at Solomon’s pool to contemplate the landscape of the bible. For current hours, guided tours and lectures you can reach Neot Kedumim at 08-977-0777. Hopefully you enjoyed your Israel tour of Neot Kedumim and you can now easily return to Jerusalem or Tel-Aviv using the map below.